Can you really blame Wall St. for cueing up Mariah Carey? We know how annoying premature holiday music can be. But can you really blame Wall Street for cueing up Mariah Carey when the Halloween season was such a complete and utter…bummer? Let’s recap just how bad October was for markets. The stock market lost more than $2.5 trillion in October for its worst month since August 2011. The Dow lost TK for the month, the S&P TK, and the Nasdaq TK. The main drivers? Fears corporate America is closing in on peak earnings, concerns over a trade war with China, and rising interest rates. The real kicker? 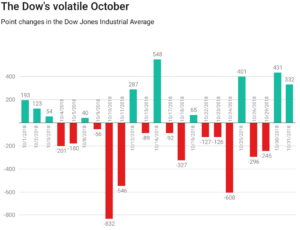 It was the most volatile October in more than a decade…and October is known for putting equities markets on a roller coaster. So who put the red in red October? Starts with a “t”, ends with “ech.” Some of the biggest names in the sector—Amazon, Facebook, Netflix, and Nvidia—posted double-digit declines last month. In two sessions earlier this week, Facebook, Amazon, Netflix, and Alphabet lost a combined $200 billion in market value…aka the equivalent of an entire Coca-Cola. The tech-heavy Nasdaq logged its worst month since November 2008. And the S&P 500 information technology sector suffered its worst month since May 2010. Just five names in the 66-stock sector finished the month in the black. And FWIW, as of earlier this week, nearly 8 in 10 companies reported better-than-expected quarterly earnings. That’s a 26.3% jump from last year.